I rarely make new friends; and practically never probe into a friends personality or try to discover what makes them tick. That’s my style and it has a name, which I discovered when I took an interest inventory called the Myers-Briggs as part of a job application. You’ve probably taken at least one interest inventory. Perhaps you took the test in high school at a test center or guidance counselor’s office. An interest inventory, if you’ve forgotten, is typically a true/false test with questions like: ‘I like to visit with my friends’ or, ‘I like to watch science fiction movies’, etc. You fill out the test, then, several days, possibly weeks pass and you are called back to the counselor and given a written report that identifies for you jobs, careers and fields of study in college that match your interests. I didn’t take one of these tests in high school; it was later, when I applied for a job at a publishing house who’s major business is processing tests and printing reports. I scanned my report, and noted that my Myers-Briggs type was INTP; I was introverted and didn’t interact much socially. So what’s new with that? I got the job — which was to write a program to tally true/false marks and name interesting jobs, careers or fields of study in college and print a report to mail back to the school. The report was to be fully automated, but should look like it could have been typed by a psychologist who actually knew the student. The first day of work, I was shown to my office in a dark, isolated cranny of the publishing house, far away from the editors, and executives who ran the company. There I met the other programmers, two soft-talking men who didn’t say more than two words when we were introduced; maybe just one word, hello. Then they returned to the office they shared. I’d get to know them better, but sharing is slow for us INTPs. Now I’m retired, but INTP doesn’t go away. It is a slow process meeting people. 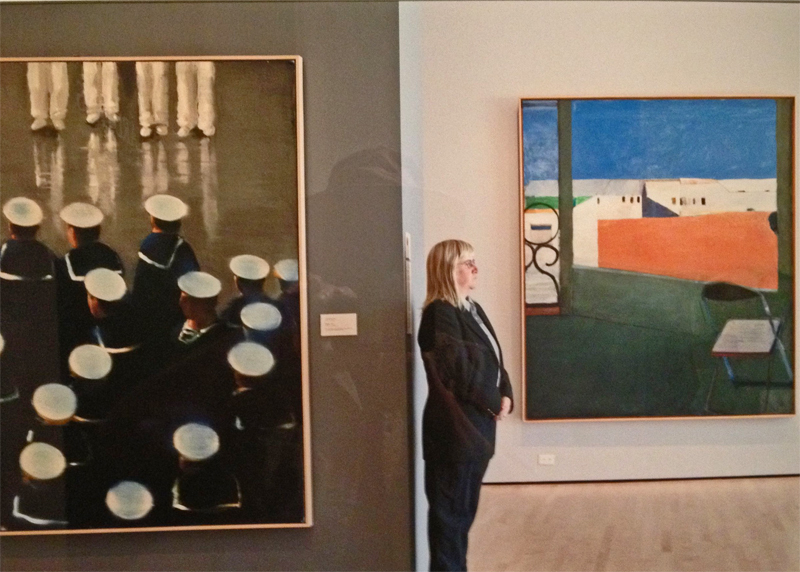 On a recent visit to the Cantor Art Center, I met a security guard, actually several of them. The occasion was the opening of the Guardians, a photography exhibit by San Francisco artist Andy Freeberg. Freeberg traveled to Russia and photographed museum guards and artworks at the Hermitage, Pushkin and several other art museums. The photographs are stunning, many are in a gallery on Freeberg’s web site. But, more amazing to me, Freeberg visited Stanford and took photos of the Cantor security staff in the same style as the photos from Russian museums. One photograph of this series is shown above. Carol has been at the Cantor for seven years and is often seen in the special exhibits gallery. She has an interesting story, as do the other guardians. She was all smiles telling me about her photo being taken. Four of the guards were interviewed on film (and posted to YouTube) by Josie Johnson, Stanford class of ’13 : Guards on Film: Andy Freeberg and Cantor Arts Center Security Staff. Their candid observations of visitors and art works is an enlightening look at the museum experience by insiders. Maybe one day I’ll break out of my INTP box and make some new friends. Who knows? This entry was posted in Places, Public Art, Stanford and tagged Andy Freeberg, cantor arts center, interest inventory, INTP, iPhone, Myers-Briggs, Postaday, Writing101 by carto. Bookmark the permalink. Hi Connie. Who’d a guessed?